Everything old is new again—or, I guess, in the case of this new Spider-Man comic, everything young is new again. Yes, get ready to re-experience the origins and teenage life of Peter Parker for the 5 billionth time in Marvel Comics history, with a brand new series beginning later this year. 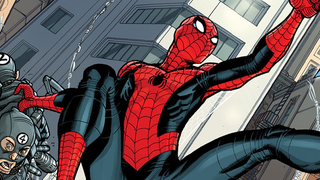 As revealed by Comicbook.com today, Spidey will be an in-continuity comic set in the past of the upcoming Amazing Spider-Man series, with a teen Peter Parker learning that with great power comes great responsibility as he balances school life with getting to grips with his spectacular superpowers. Written by Silk’s Robbie Thompson with art by Nick Bradshaw (Wolverine and the X-Men), the series is meant to harken back to the era of classic Spider-Man, both in tone and the litany of villains young Peter Parker will face. You thought 3 movie reboots were bad? It was interesting to see the upcoming Amazing Spider-Man reboot series as part of Marvel’s “All-New, All-Different” universe, mainly because it focused on an adult Peter Parker, one who’d become successful both in his civilian and his superhero life, but most importantly a Peter Parker that had moved on from the teenage kid unsure of himself that we’ve seen in countless adaptations and comics. But alas, we’re getting a young, teenage Spider-Man in the Marvel Cinematic Universe, so naturally the comics have to morph to fit that development too. Marvel just can’t let that teenage Spider-Man go—but at least this time it’s a change that doesn’t come at the cost of losing the current, matured Spider-Man. Spidey #1 will be available as part of Marvel’s shakeup of their Comic roster later this year.